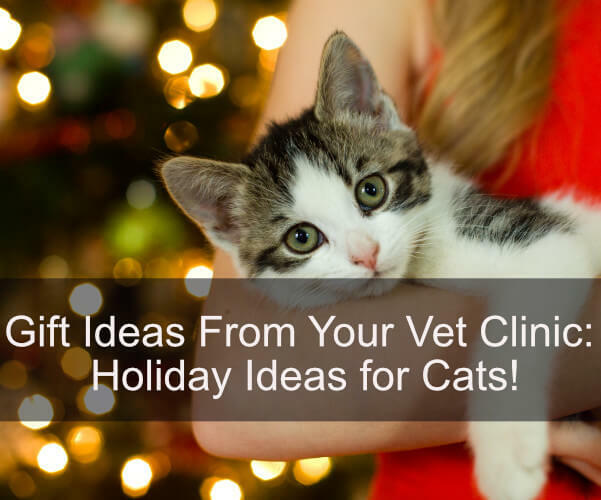 Gift Ideas From Your Vet Clinic: Holiday Ideas for Cats! Cats can be moody and standoffish, but when they love you they let you know. Whether you have a cat that sticks so close you secretly wonder if they’re a dog, or you have a cat that only needs affection occasionally, you adore them too. What may be harder to figure out is what to get your sweet feline friend for the holidays. Although 95% of pet owners have bought holiday presents for their furry friend, it’s always fun to get new ideas. At the Bowman Road Animal Clinic, we decided to weigh in. Here are some kitty gift ideas from your Little Rock vet clinic! As much fun as it is to have a cat, no one enjoys having their furniture destroyed. However, cats need to scratch – it’s part of their normal behavior. To protect your belongings, you need plenty of scratching posts! Don’t assume a scratching post has to be unattractive. There are a variety of modern-looking and even stylish options to choose from. Get your kitty friend something they can enjoy without getting in trouble this holiday! Sometimes the best gifts are the simplest. There are wire toys with cardboard wrapped up on each end. Cats adore this inexpensive gift! It bounces erratically, mimicking the behavior of a flying insect. Even lazy cats will take notice, get up, and see what all the fuss is about! You really don’t have to spend a lot of money to make your cat happy. A simple wire toy will do the trick. Of course, keep an eye on them – you don’t want them to manage to hurt themselves and end up in our vet clinic! It almost goes without saying, but almost every cat loves catnip. You can purchase it or you can even choose to grow your own! Cats react to catnip in a variety of ways. Smelling it often makes them very excited, but if the cat eats catnip it will act as a sedative. The effects usually don’t last beyond a few minutes, but the cat love it and can’t wait to get more! If catnip alone is too messy, you can also choose catnip infused toys. Not every cat adores catnip, but if yours does this is a great gift! Don’t worry about it being safe – catnip is fine for cats. If they eat too much, they can get sick, but it will pass. If you have any concerns, reach out to us – our vet clinic is happy to help! From balls to stuffed mice, cats love batting things around the house and chasing them. It’s a great way for them to stay active and sometimes they’ll even play with them without your involvement. Different cats enjoy different toys, so don’t splurge too much until you know for sure your cat enjoys it. A ball with a bell, a mouse, larger kick toys, and even feathers on a string can be great presents for cats. Keeping your cat active is one way to keep them healthy and out of the vet clinic, so find what they love to chase and grab some for them this holiday! Best Vet Clinic Recommendation: Boxes! There’s nothing more aggravating than getting a cat a great gift, only to see them enjoy the box more than the toy! Take advantage of that by saving various boxes during the holidays and setting them out for your cats. Mixed with catnip and other toys, it can be a kitty wonderland! We hope that your cats stay happy and healthy this holiday season, but things happen. We want you to know that your Little Rock vet clinic is here for you if you need help. If your cat is ill or acting unusual, contact us for an appointment today!